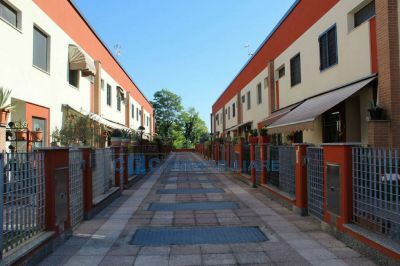 Ref: Ontano 5 - Rodano-Millepini: quiet town 6 km east of Milan, rich in green services of first necessity (easy access to the eastern ring road, restaurants, playgrounds). In a residential complex of the 90s in excellent condition, surrounded by greenery less than five minutes from the center, we offer a terraced house of 140 square meters with 40 square meters of private garden, divided as follows: on the ground floor we find a cozy living room with separate kitchen , bathroom; the internal staircase leads to the first floor which is completely dedicated to the sleeping area, consisting of two bedrooms with a balcony and a second bathroom; on the semi basement floor we find a spacious open space tavern with fireplace Internally the villa is completely renovated, aluminum frames with double glazing. Complete the solution a large box included in the price. Mobile Phone: 375 588 18 36.